Last Sunday I went for an Iftar food walk in the bylanes of Old Delhi. I had been meaning to do this ever since I moved to the capital three years ago. 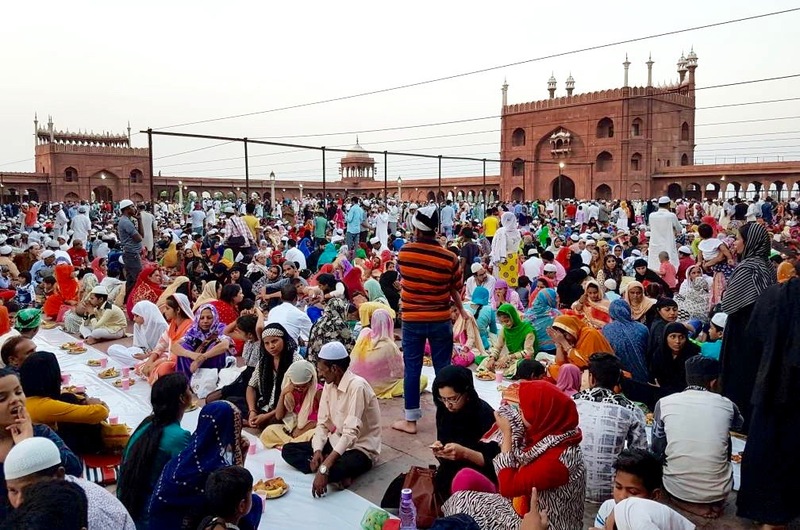 I had heard how Old Delhi was the place to be at when the faithful break their fast in the shadow of the imposing Jama Masjid during the holy month of Ramzan. The place is famous for its food anyway — there are hole-in-the-wall eateries that make the most amazing kormas, niharis and kebabs, and the most gorgeous sweets and savouries. But Iftar promised to deliver Old Delhi and its stunning tastes in particularly splendorous ways. And so off I went to explore them. My guide was Ramit Mitra, who runs the excellent Delhi By Foot heritage and food walk tours. Having interacted with Ramit before, I knew he was a connoisseur of good food. I knew he would guide us to some hidden gems (well, at any rate, hidden from Delhi newbies like me.) I had already done Puraani Dilli staples like Paranthewale Gali (overrated) or Hazarilal Jain Khurchan Wale (outstanding). Now I was all set to find a few more gastronomic hotspots. We got out at Chawri Bazaar metro station and headed into a narrow lane in the Huaz Quazi area. 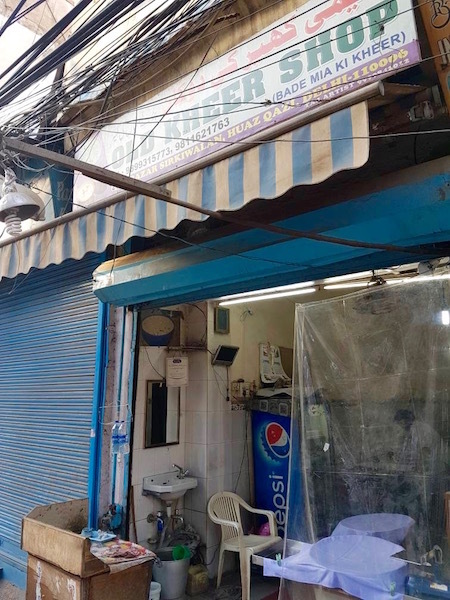 The first stop was a little place called Old Kheer Shop, formerly known as Bade Miyan Ki Kheer. I wasn’t too keen on kicking off a culinary expedition with something sweet — I do like desserts to be the final flourish of my meals. But after having one spoonful of this astonishing kheer, all I could do was polish off the rest with quiet concentration. The kheer was made with rice, as is customary in most parts of India. (In Bengal we call reduced milk kheer as distinct from the with-rice variety, which is called payesh). This particular kheer was thick and creamy with a faint taste of cardamom. There was a scrumptious, darkish crust of cream on top, which told a tale of many hours of patient simmering of the milk. 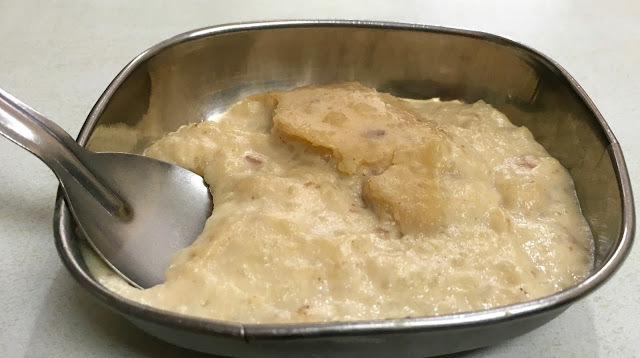 It was kheer that wanted to be rabri, but stopped short of it at some happy point, rendering a dessert that had just the right amount of sweet, the right amount of texture from the tiny grains of rice, and was guaranteed to make you feel benevolent towards the whole world. We learned later that this particular kheer joint is over a hundred years old. Its original owner was a jeweller. He made a lot of money and bought several buffaloes to mark his elevated status in life. Now the buffaloes started giving so much milk that someone in the family hit upon the idea of making kheer and selling it. A great idea that’s clearly stood the test of time. One more nugget around this king of kheers: Madhubala, perhaps the most beautiful Hindi movie star of all time, was born in the building that houses the shop. Don’t know if that made the kheer seem sweeter. The afternoon sun on this June day was not kind. But good food beckoned and we made our way through narrow lanes packed to the rafters with people and shops selling everything from footwear to utensils. It didn’t look like there was room to move along. But move we did, jostled by the crowds, and often a hair’s breadth away from being run over by a cycle rickshaw or a pesky motor bike. We stopped at many places. I shall mention just a few of the items I ate on this walk. 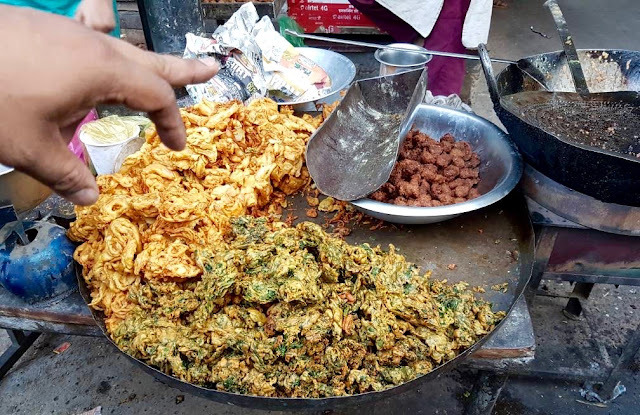 There was much to be sampled — bhajiyas being fried in huge kadhais of oil, a multitude of mithais and savouries piled high on huge platters that would no doubt fly off when it was time for Iftar. In one place I saw a man slicing whole skinned chickens and flinging them into a giant aluminium cauldron. And almost anywhere you looked there were skewers with chunks of meat on them that smoked and sizzled on red hot chullahs. Old Delhi is in any case a place that throws up a fabulous smorgasbord of food. However, during Ramzan there are some unique stuff on offer that aren’t available at other times. For instance, I had this thing called meat golis from a roadside food stall in Ballimaran, a short walk from Mirza Ghalib’s haveli. They were marble sized balls of minced meat mixed with besan and spices and crisp fried. You couldn’t taste the meat per se but the flavour of this snack, hot off the fire, was amazing. The shop’s owner said that the mince was a mix of everything — goat, buff and chicken. Well, whatever went into it, those fried morsels of meat were irresistible. Then there was meetha samosa — also a Ramzan speciality — which is somewhat similar to Bengal’s kheerer shingara. This one had a filling of khoya, grated coconut, a soupcon of dry fruits, and was fried and dipped in sugar syrup to give it a sweet, sticky glaze. Though I had foresworn sweets after that substantial plate of kheer, there was no way I was saying 'no' to this delicious samosa. Ramit took us to Manzoor Hotel, which sits at the entry of Gali Quasim Jaan if you enter from the Lal Kuan side. Famous for its korma and nihari, this is yet another match-box sized, bare-bones eatery where wall mounted fans whir noisily and churn the hot sultry air. This place serves beef (buff), we were told. Oh, goody, I rejoiced mentally, happy to see that the government’s cattle slaughter ban notification hadn’t made buff disappear from the plates in the run-up to Eid. We were given a korma and a dal gosht, both made with buff. I wasn’t too impressed with the korma — it was too oily for my taste. But the dal meat was outstanding. 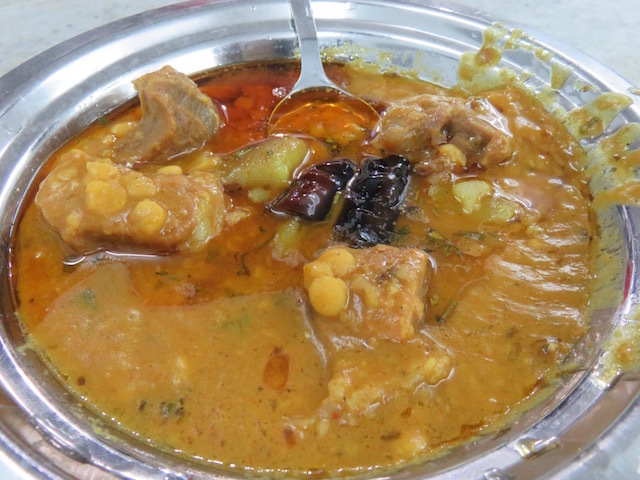 As far as dishes go this was fairly basic — channa dal cooked with buff meat. But, boy, was it delicious. The meat was tender, the dal moderately spiced and not over or under cooked (always a possibility when eateries attempt channa dal). Scooped up with hot tandoori rotis, this was a dish to die for. The crowds swelled as the time for Iftar approached. We scrambled our way to the Jama Masjid and entered its majestic gateway with our heads covered and our shoes in our hands. It was my first experience of the mosque and it seemed to me that India’s billion and more people were right there right then. Evidently, Iftar hour is not the best hour to have one’s first brush with this holy place. Ramit had organised some chicken samosas for the group to be eaten when it was time for Iftar. This is a Ramzan speciality too, but it left me a bit underwhelmed. Or maybe, I was too overwhelmed by the suffocating press of people to savour and appreciate anything. 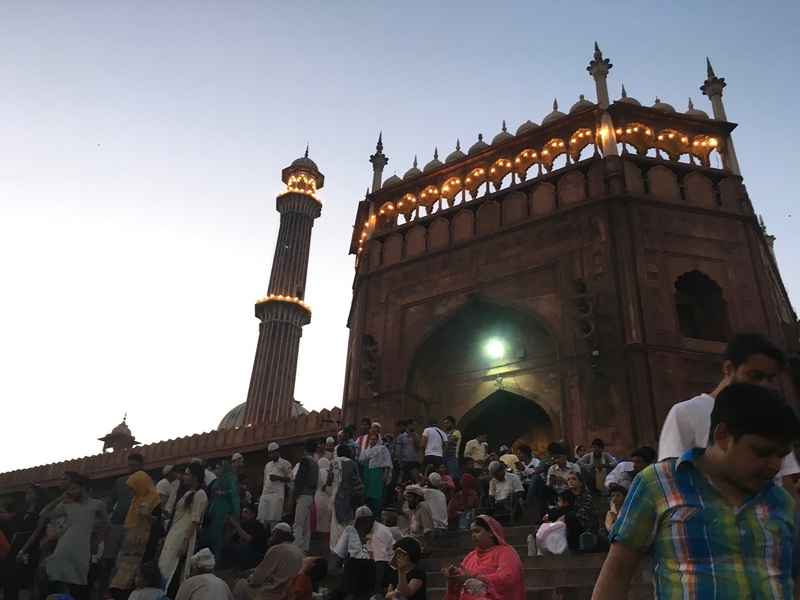 After we exited the Jama Masjid and its teeming precincts, our foodie crawl began anew. By now the sun had set and the area was all lit up like a giddy fairground. We went into a dimly lit passageway lined with plastic stools. This is where we sat and ate Butter Chicken from Anmol Chicken, an eatery slap bang in the middle of the tumult of Urdu Bazaar Road opposite the Jama Masjid. What can I say about this godly chicken dish? Obviously, it’s nothing like the ghastly chicken butter masala one encounters in most Indian restaurants. This one was char-grilled to perfection, basted generously with butter (Amul Butter, Ramit informed us), wondrously succulent, with just that hint of smokiness from the fire on which it was cooked. Now chicken is my least favourite flesh, but this was so jaw-droppingly good that it almost fell out of my mouth. The chicken (with bones, thankfully — I can’t bear the boneless kind) comes in a bed of delicious butter sauce. Swirl your chicken in the butter a bit more and pop it in your mouth. Verily, it’s hard to stop at one — even on a full stomach on a steaming hot day in riotous Old Delhi. 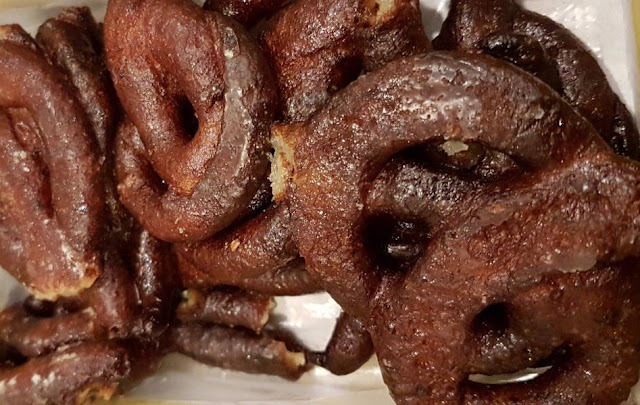 A little ahead, we sampled another Iftar delicacy — paneer jalebis at Kallan Sweets. I wouldn’t say they were terrific, but they were certainly interesting. Next, we swooped upon some fried fish at Haji Mohammad in Matia Mahal. This was another tremendous find: a)because I am Bengali and I love fish in any form and b)because those fat steaks of fatty surmai, fried in a light batter, were seriously delicious. I. CANNOT. EAT. ANYMORE, I panted, and chomped on one just the same. Matia Mahal is famous as it houses such tourist draws as Karim's and Al-Jawahar, specialists in Mughlai cuisine. Aslam’s Chicken, another eatery that’s renowned for its Butter Chicken, is also located here. In fact, there were people in our group who swore that Aslam’s offering was way better than the Butter Chicken we had at Anmol’s. I mean to go back and check and so should you. If you are in these parts, during or post Ramzan or indeed at anytime at all, be sure to pause before Sultan Ji Sweets and Snacks, right beside Haji Mohammad. This is where I had mawa jalebi — jalebi made with khoya inside, deep fried a rich mahogany, soft and dripping with sugar syrup. It was simply out of this world. There is no other way to describe it. They also had gulab jamun — not the pale brown abominations that you get everywhere, but dark, glistening orbs of temptation that tasted as heavenly as they looked. I could go on. I could talk about khajla and pheeni, the floury confections to be had with hot milk at Sehri before the faithful embark upon the day-long fast. Or wax lyrical about the special sheermal at Golden Bakery, also on Matia Mahal Road, where they slice open the sheermal and sandwich it with jam and butter — another Sehri favourite. But truth be told, Old Delhi during Ramzan is no place to be experienced vicariously. You need to jump in and enjoy the goodies yourself. Me, I’m already making a list of the places I want to go back to. Hi Shuma, great to read your mouth watering journey. Hope I can make it before Eid. Got to know of this write-up from Vivek's tweet. Great. Hey Sujit! What a pleasant surprise! Glad you liked the post. Thanks! Ohh my god, my mouth is literally flooding with saliva. Such an impressive description of old delhi. Hope to visit this soon. Thank you, Aman. Yes, indeed, you must visit Old Delhi -- the food is unbeatable! The article is an absolute delight Shuma. Cannot wait to get back to Delhi and use this as a food guide!!! The other day we went to this restaurant called Pot Belly. The name was endearing enough. But what intrigued me was that its USP was Bihari cuisine. Now, I would not have described myself as insular, but the fact is that though I am from Bengal, and Bihar is a neighbouring state, I was completely unaware that Biharis have a distinctive culinary repertoire. That’s what the wise folks who issue food diktats from time to time say. (Too much salt’s bad for you! No dammit, it couldbe good for you!) 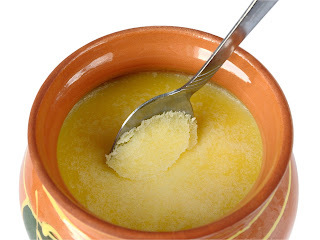 They say that far from being a lethal, artery-clogging, adipose-adding substance, ghee is actually great for your health. In fact, ghee’s place is now up there amongst such allegedly miraculous superfoods as quinoa, açai berries, chia seeds, kale and so on. Now, I don’t know if ghee is a superfood. What I do know is that I have always considered it to be a SUPER food. Super as in yummy. Super as in oh-please-I-want-some-more! So I like to have a little ghee with my steamed rice once or twice a week. Indeed, one of my all-time favourite comfort foods is plain ghee-bhaat — piping hot steamed basmati rice with a bit of good quality ghee and a pinch of salt. I’ve always felt guilty about this little indulgence of mine. But thanks to ghee’s recent elevation as a nutritional rockstar, I feel much better about it now. A journo by day and a foodie at all times, Shuma Raha will forage far and wide in search of some top quality nosh. She will rise to every culinary bait ...er, with the exception perhaps of stuff like deep fried creepy-crawlies on the streets of Bangkok. She believes that cooking is a joyous thing and great food the nearest thing to heaven. Her credo: Good taste is all.